How Much Money are Players Spending on League of Legends? If you ask someone who plays League of Legends, most of them will tell you that it's a free-to-play game, although there are some who might find that statement funny. If you've been playing the game for a few seasons now, you might have realized that you've spent a few hundred, or thousand dollars on it. Even though you can play it for free, there are a lot of temptations that make it hard for you to avoid spending your money. As a player you basically have 2 options: invest your time into playing a lot of hours in order to get influence points, and unlock Runes and Champions so that you can make progress in the game, or spend money on buying Riot Points, and use them to buy all kinds of goodies. Now that League of Legends has entered its 8th season it's as good a time as any to reflect back on just how much money players have spent on the game, and how much the creators have earned from these microtransactions. You might be surprised by the number. Before we begin talking about its popularity, we need to start with a small introduction of LoL, for the handful of people out there who are still not familiar with it. League of Legends is a multiplayer battle game, developed by Riot Games, and it's available for both Microsoft Windows and macOS. LoL works on a freemium model, but it also generates money from microtransactions. These microtransactions allow players to buy new skins for characters and wards, unlock champions, buy mystery boxes, keys, influence-points boosts and so on. Last year alone, the game made more than $1 billion from these microtransactions. The game was released back in 2009, was immediately very well received, and has grown in popularity ever since. The way the game works is you control your champion and use his/her abilities to battle against the other team of players. The main goal is usually to destroy the nexus of the other team, which is a protected structure in the center of their base, but there are other game models as well. How Popular is League of Legends? LoL has a pretty big fanbase, that's constantly expanding. In 2012 LoL was the no. 1 played PC game in Europe and North America, and starting from January 2014 it's estimated that over 67M people play the game per month, 27M per day, and 7.5M during peak hours. That was the case untill 2016, where the number rose up to 100 million active monthly players. In 2017, the World Championship was followed by over 60 million viewers from all over the world. Its popularity lead to the development of a lot of merchandise, toys, accessories, books, documentaries and web series. How Much Money Are Players Spending, and How do They Feel About it? There are a lot of polls that pop up on League boards, or on Reddit created to determine how much money players are spending on the game, and how much they've spent in total over the years. Although what we can see from most of the polls conducted is that the majority of the players have spent more than $1000, the first-hand statements you can find on Reddit provide a much clearer picture. Even though most of the players admit to spending at least a few hundred to one or two thousand dollars since they started playing, most of them don't regret spending their money, and justify their spending in a few ways. 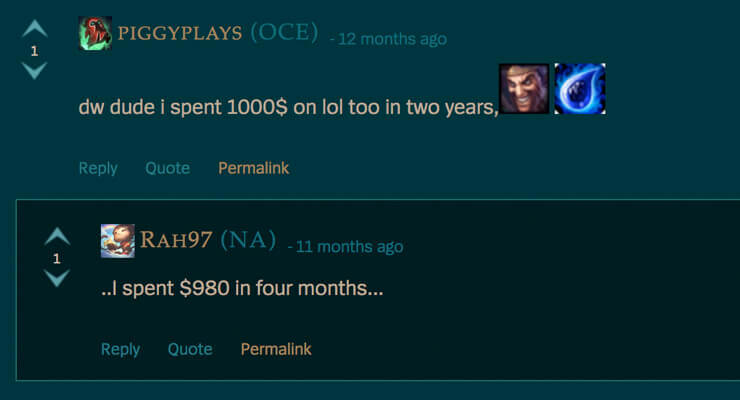 So how much are you spending on League of Legends? You can check your spending stats on the Riotgames website - if you dare! If you read through a few of their comments, you'll see that although some are shocked and weren't expecting to see such a high number, most of them are not concerned. Some justify their spending by saying that they do not have a lot of free time on their hands, so rather than investing hours and hours into playing the game just so they can get enough IP to get the newer champions, they could pay the amount, and save in time, which in the end might be more worth to them. Others see LoL as one of their favorite hobbies that has given them a lot of entertainment throughout the years, and therefore don't regret a dime they spent on it. Most of these users said that they've spent around $1,500 - $2,000 over the course of 3-4 years, which by their estimations is not even close to how much they've spent on other stuff that hasn't given them as much joy as LoL has. Some users on the other had are shocked by how much money they've spent since they started playing, and feel as though they got played by the game. They say that most of the things they bought they didn't really need to have, and complained about some of the routine server outrages and game bugs from which the game still suffers. They expressed their negative opinion quite strongly, and blamed LoL for tricking people into buying unnecessary stuff just so they can keep up with the rest of the players. Most of the situations, however, weren't that drastic. A lot of users reported spending around $200-$1,000 through the course of few years, and admitted that although some people can easily lose track of their spending, that's not the case with everyone. They disagree with the others and don't feel like they have to keep spending money in order to progress in the game. If you don't want to spend any money on the game, it's up to you. The truth is you can buy practically anything in the game as long as you put in enough play time.